My favorite restaurant in Grand Rapids is Marie Catrib’s, named after the fabulous woman who moved from Lebanon to Michigan over forty years ago and, in 2004, opened her restaurant in the then-sketchy, now-vibrant East Hills neighborhood. The restaurant is bright and cheery and perfect, and Marie Catrib herself was usually there, quick to offer a kind word, comforting smile and generous quarter-cookie sample. She always made me feel special, picking up the tab when I went with my parents on my birthday one year and lighting up with recognition when I caught her eye, but I wasn’t the only one who felt that way—everyone felt welcome and wanted by Marie. When we got married, I knew Marie’s had to be involved. The restaurant provided our fantastic spread of cakes, summery fruit crisps and fudgy brownies. Marie passed away this past June after several years struggling with cancer, yet the restaurant still sparkles with her magic. Along with providing many a dinner and take-out container of Mediterranean-influenced deli sides (Bulgar Wheat with Sundried Fruits! Mother Earth Salad!) during my years in Grand Rapids, Marie’s was my favorite place to stop before work. It was close to my apartment but in the opposite direction from my office, so I’d go just a few times a month, infrequently enough that it felt like an occasion. I went half for the dark coffee and delicious pastries and half for the way it transformed my mood. At this time of year, I’d step in from the cold and dark of Michigan winter to be instantly cheered by the brightly colored paintings, the kind employees and the sight of happy breakfasters with their hands wrapped tightly around mugs of coffee. 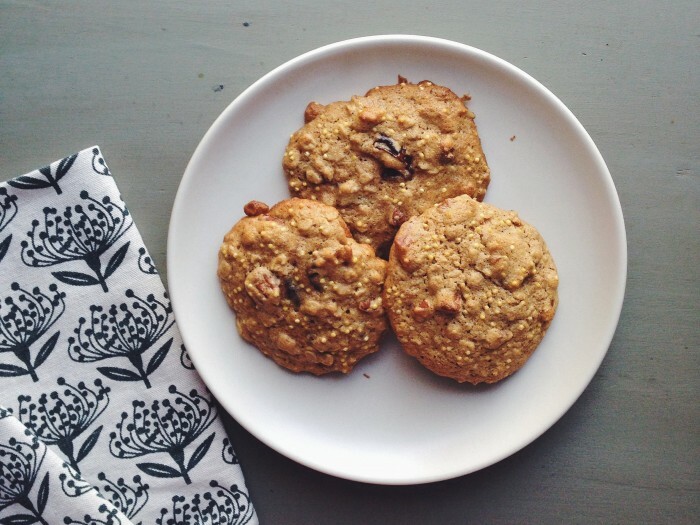 My treat of choice was the breakfast cookie, a thick cookie with a crisp exterior and dense yet light interior, made hearty with whole wheat, wheat germ and bran and packed with raisins, dates and almonds. I would bring it to the office, unwrap it carefully and savor it all morning. 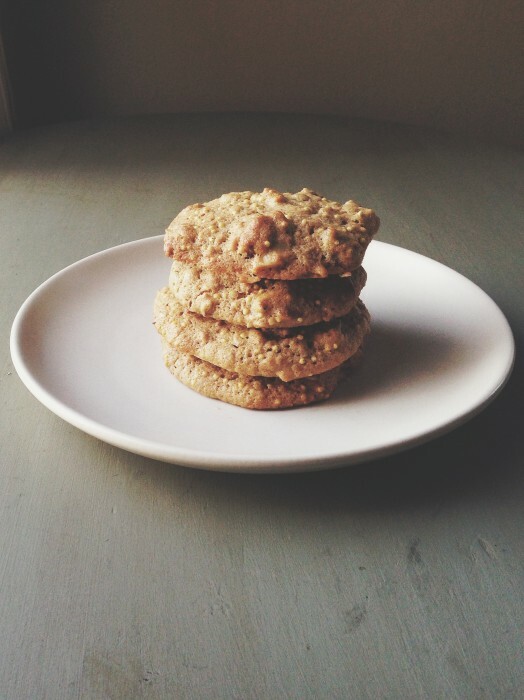 When I saw the millet breakfast cookie in Megan Gordon’s new book, Whole-Grain Mornings, I knew I had to make it. Though different from Marie’s cookie, this one is also delicious, and the sense of comfort, coziness and hope that emanates from my favorite restaurant is the same one you’ll get when, with cookie in hand, you read Megan’s stories and recipes. I was first introduced to Megan, her blog and her granola in an early issue of Remedy Quarterly. Reading Meg’s blog, I found we shared a love of simple cakes, good books, interesting flours, seasonal fruits and thoughtful, slightly sentimental musings. We’ve since become Internet pals, and though we’ve not yet met in person, I’ve experienced her genuineness, kindness and honesty enough to feel we have. Flipping through Megan’s book, it’s easy to imagine you’re sitting at her kitchen table, sipping coffee and sharing stories as she feeds you Peach Breakfast Cobbler with Cornmeal Thyme Biscuits, Greens and Grains Scramble, Saucy Tomato Poached Eggs with Kale and Wheat Berries, Whole-Grain Gingerbread or The Very Best Oatmeal (with plenty of toppings). She splits the book into seasons, and in each category you’ll find breakfasts deemed seasonal either by ingredients or the way they make you feel. Her stories also fall into the seasons—the transition from teacher to baker, the explosion of her business, a move into an apartment all her own, a budding relationship. I love this. I, too, see my life in seasons. All this to say, Whole-Grain Mornings will surely win you over to the practice of breakfasting, the goodness of whole grains and Megan herself. The book will be released tomorrow, December 31, and I can’t think of a better way to kick off the new year than by picking up a copy for yourself or someone you love. Preheat the oven to 350 degrees. Line one large baking sheet or two small baking sheets with parchment paper. 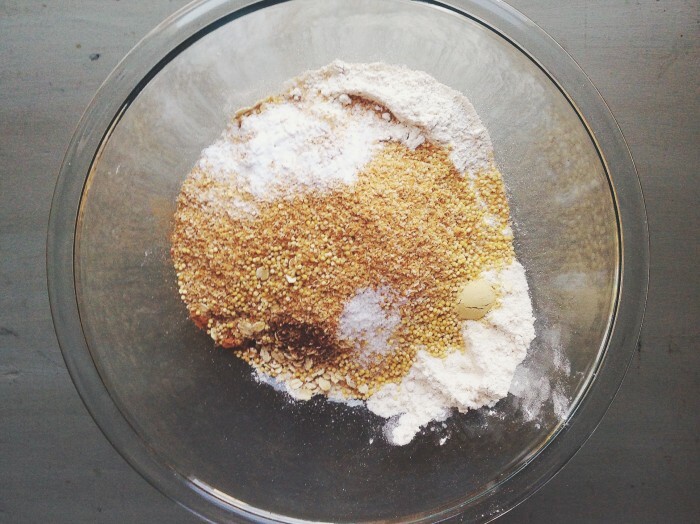 In a large bowl, whisk together the flours, oats, millet, bran, baking soda, baking powder, spices and salt. In another bowl, which together the coconut oil, maple syrup, egg and vanilla. Add to the dry ingredients and fold in until incorporated. Stir in the dates and nuts until evenly dispersed. Let the dough rest for 10 minutes. Bake until golden brown around the edges and firmed yet still slightly soft in the center (they’ll continue firming up as they cool), about 12 minutes. Let the cookies cool for 10 minutes on the baking sheet, then transfer to a wire rack to cool completely. If kept in an airtight container, they will remain fresh for 3 to 4 days. The cookies also freeze well. I’ve heard such good things about this book; every recipe sounds like it’s a total winner. I love this kind of warm and comforting cookie. Perfect for a chilly morning. 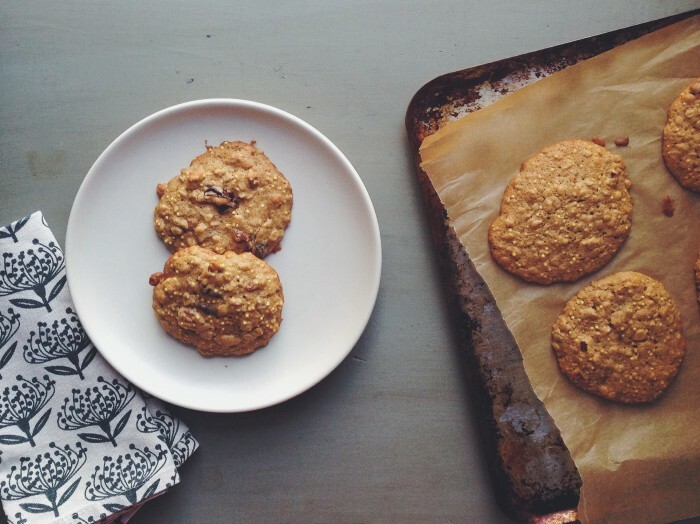 I love the idea of starting the new year off with cookies for breakfast. Thanks for sharing! BEAUTIFUL, beautiful cookies, Stacy! I’m so, so glad you had some down time to make them during the holiday and I love the story of Marie. Thank you so much for your sweet words about the book. February: we meet! xox + happy New Year! I love stories like this one, of generous, warm-hearted people and the food they’ve fed us. I also love Megan’s book. : ) Happy New Year, Stacy! Great cookies and a lovely heartfelt post. I would like to try them, but I just have a (silly) question as I love millet, but usually I boil it before eating it. Do you add it raw to the cookie dough? Thank you for your attention. Hi Cristina! Not a silly question at all. You do add the millet raw – it adds a lovely crunch, but I promise you won’t feel as though you’re eating something uncooked. (: I hope you’ll give these a go! Stacy, Happy New Year to you! I hope 2014 is off to a good start. Cookies for breakfast? Works for me. Just ate a bite of a GF breakfast cookie I got at Marie Catrib’s yesterday. I jjust spent a couple of weeks in GR (my sister has lived there for 2 years and my mom was born there and lived there until she was 14). It was really wonderful, so I decided to look up breakfast cookie recipes and stumbled across yours. I love millet and am thinking I’ll try these very soon. My sister introduced me to Marie Catrib’s and we went there three times in the 2 weeks there. Twice we went for lunch – had the Larry David and the sweet potato quinoa burger on GF branny oat bread – both were wonderful. Also had some amazing GF vegan chocolate balsamic cookies. Tried two of the soups – African peanut and gazpacho and the potatoes – all were super yummy. Also tried a GF vegan mac-n-cheese – also super yummy. Basically, everything I’ve tried there (except a GF vegan chocolate rhubarb cupcake which was decent) has been amazing. And I absolutely love the atmosphere. Marie sounds like she was a great woman.